If Halloween is not a time that you can feel OK about crossing over to the dark side, then we simply don’t know what is. So go on, give in to your shadow self. Of course, we do not mean you should actually go off and become a vampire (unless that’s your thing), but you sure can enjoy dressing like a creature of the night! 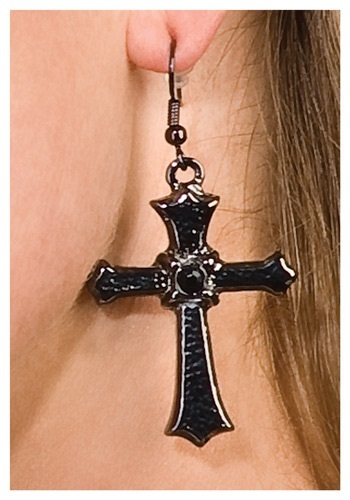 These Black Cross Earrings show off your temporary lust for blood and comfort in the cover of night when you wear them to accompany a great gothic or ghoulish costume. Whether you dangle this gem-kissed pair over a daring mini or corseted gown, you will feel regal and ready to embrace your darker instincts...or at least gorge yourself on mini candies in your coffin in fine style!